Okay, well maybe I'm being a little dramatic...I'm a snob only when it comes to dessert...especially banana bread. I do not eat anyone's banana bread except mine or my Momma's. That's the truth. As I am sitting here typing this I am trying hard to think of the last time I ate banana bread made by anyone else and I really can't think of even once in the last couple years that I have. I could be wrong, so forgive me if I am. But the only reason I'd ever eat someone else's banana bread is out of pure politeness and if I have, the experience obviously didn't stick with me. Anyone else's or even store bought loaves never taste right to me. Not enough bananas? Bananas not ripe enough ? Not moist enough? I don't know what it is. My mother in law loves the banana bread that a friend at church makes....so I may have to break down and try it one day, but even still...she's made those muffins multiple times for bake sales and I just can't seem to go there...and she's an excellent baker...lol..I know, I have problems...Just to be clear, I have had other banana bread in the past. Most of the time I can tell by looking at it if their recipe is similar to mine and will usually try to politely pass. I've been disappointed too many times... My sister in law made a banana CAKE with chocolate icing...which was incredible..but that was a cake..not bread..lol...So, why such strong feelings? I told you. I'm a snob. ha ha...Well, I am one of those people who can eat almost anything...as long as it's not dessert related. Once you get to the dessert category though all bets are off. I have too many RULES. Rule # 5. Water ice should never have actual pieces of fruit in them...especially cherries. SOOOO....What do y'all think? Do you indulge no matter what? Or are you picky like me? Okay, so first preheat the oven to 350 degrees Fahrenheit and grease and flour two loaf pans. Set aside. Next..mash the bananas in a medium mixing bowl. Add the eggs and melted margarine. In a large mixing bowl combine flour, sugar, baking soda, and baking powder. Mix together. Next, add the banana mixture to the dry ingredients and combine thoroughly with a large spoon. 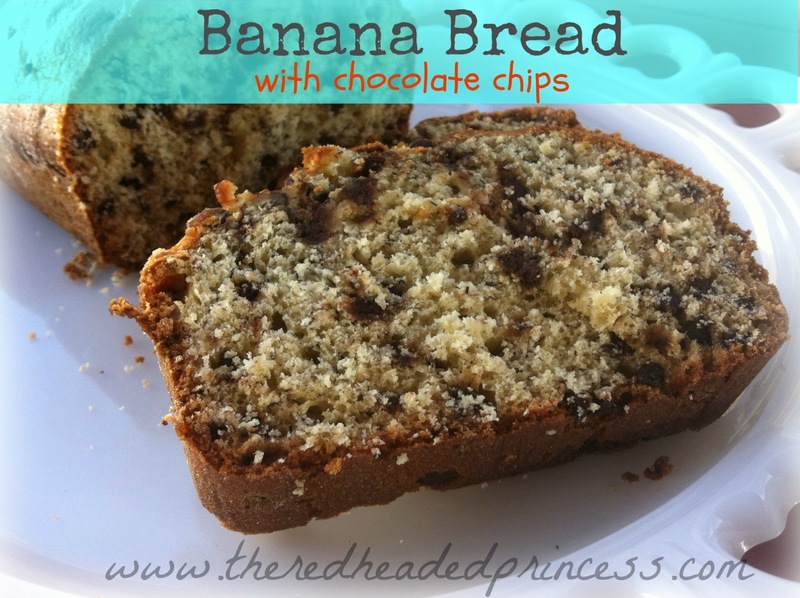 If you would like chocolate chip banana bread then add however many chocolate chips (or heaven forbid...nuts...) to the batter. Or do like I do and pour half the batter in one greased and floured loaf pan and then add the chocolate chips to the remaining batter. Bake at 350 degrees Fahrenheit for 45 minutes or till a toothpick in the center comes out clean. Don't over cook the banana bread or it will be dry. Not fun. I usually will warm mine in the microwave and add some butter for a delicious breakfast. **Tip: Wrap the banana bread in plastic wrap and put in a large freezer bag. Freezes well for a few months. To thaw just put in the fridge or set it on the counter for 24 hours. Hey Holly! Thanks for stopping by! Yes..rules are a must for desserts. Do you have to pay anything up front to work with Passionfruit? 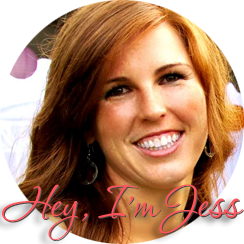 I actually have my left sidebar open to start with sponsoring but just haven't gotten around to it yet. 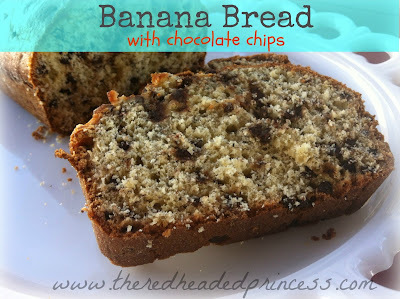 I have never tasted banana bread but this recipe looks like one to try. My kids will eat anything with chocolate chips in it. Southern Green Beans and Mashed Potatoes!